Alois L. Jud was born on 1 January 1846 in Elsaß. He was known as Schutt. Morand Jud and Anne Marie Argast arrived in the Port of New York on 15 June 1859, accompanied by Alois L. Jud, Anna Jud, Anne Marie Jud, Joseph Jud and Josephine Jud from Le Havre aboard the Packet Ship William Tell, traveling " lower between decks." The following appeared on 21 May 1877 in the Cleveland Daily Plain Dealer: In the [Cuyahoga] Probate Court a case of habeas corpus was brought by Wilhelmina Schutt. The plaintiff and her husband, Alouis Schutt, both sued for divorce. The cross petition of the defendant was withdrawn and the case was tried before Judge Cadwell on the plaintiff's petition. The Judge concluded that he could not grant a divorce to either party. This case of habeas corpus was brought for the custody of the children. Judge Tilden granted the custody of the children to the plaintiff. He married Anna Paulina Waldheger, daughter of (?) Waldheger and Unknown (? ), on 28 September 1877 in Cuyahoga County, Ohio. Alois L. Jud and Anna Paulina Waldheger appeared in the US federal census of 1 June 1880 in Cleveland, Cuyahoga County, Ohio, at 996 Sheriff Street. Other members of the household included Frank H. Stevens, Albert Leo Stevens and Jerry Hofner. It is an educated guess that Frankie (age 5) and Joseph (2) are the future Frank and Leo Stevens. It is not clear whether Mamie (age 8) and sons Latte (9) and Alois L. (6) belong to Alois or to Anna. He was a locksmith, according to the 1880 census. He applied for a passport on 3 April 1889 while living in Cleveland, Ohio, at 996 Sheriff Street. The passport was issued to Alois and Annie P. Schutt on 5 April 1889. The following appeared on 3 June 1893 in the Cleveland Evening Plain Dealer: The gun store of A. L. Schutt, No. 241 Sheriff street, was broken into Sunday and guns, revolvers and billies to the value of $95 taken. The following appeared on 11 February 1896 in the Cleveland Plain Dealer: Burglars made entrance to A. L. Schutt's gun store, at No. 241 Sheriff street, some time during Sunday night and got away with property valued at $71.50. 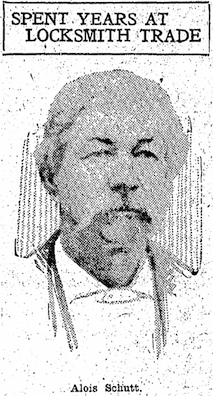 The following appeared on 16 May 1897 in the Cleveland Plain Dealer: A much worried man yesterday was A. L. Schutt, the Sheriff street gunsmith, who lives at No. 1461 Clark avenue. He was unable to gain any information concerning his two sons, Lewis and Frank, who were supposed to be drowned off Sandy Hook while making a balloon ascension at Jersey City. News which reached this city was to the effect that two young men, supposed to be from Cleveland, accompanied by a third man, had gone up in a balloon at Jersey City and that the balloon was seen to fall into the ocean off Sandy Hook. By the professional names given Mr. Schutt was positive the two mentioned were his sons, who are well known aeronauts. They have a place of business in New York city and employ men to make ascensions, but Schutt was firmly of the opinion that they would not do so themselves. Nevertheless he was greatly worried and his wife was driven nearly frantic. Schutt telegraphed to different points in New York city and late last night received a telegram that relieved him more than words can tell. The telegram was from Mrs. Wands, with whom the boys boarded. She simply stated that the boys had just telegraphed her from Jersey City saying they would reach New York shortly. Whether or not the two boys made the ascent and if they did how they managed to escape death is, of course, unknown to Schutt. Alois L. Jud and Anna Paulina Waldheger appeared in the US federal census of 1 June 1900 in Cleveland, Cuyahoga County, Ohio. Other members of the household included Charles Morand Schutt, Michael Anthony Schutt, Oscar F. Schutt and Anna M. Schutt. Alois L. Jud became a widower at the 26 November 1900 death of his wife Anna Paulina Waldheger. The following appeared on 30 April 1902 in the Cleveland Plain Dealer: Leo Stevens, a Clevelander, is creating a stir in New York city as an aeronaut. When eleven years old Stevens ran away from his home in this city and has ever since been engaged at riding the air in balloons, having made over 2,000 ascensions. During the fifteen years of his romantic occupation Stevens has been working on what he calls "a ship of the heavens," which he intends to launch soon. His ship is now practically completed. It is eighty-four feet long and thirty-six feet high and weighs about 600 pounds. A frame of thin steel pipe is attached to the balloon firmly by plano wire and a gasoline engine, seven and a half horse power, is set in the center of a steel frame. Before the seat turns a shaft that extends forward to a wheel. The wings revolve 2,700 times a minute. The gasoline, which is stored in a tank, is sufficient to carry the ship seventy-five miles. A tank filled with water hovers back and forth and causes the ship to descend. The ship is in reality a balloon within a balloon, and at the side of the main balloon hang loosely gathered wings. The machine has cost about $10,000 and New Yorkers will not be surprised to see Stevens go sailing any day. On June 1 Stevens will set sail from Larchmont, Long Island sound, and will ride to Broadway circle. Stevens is well known in Cleveland, he being a son-in-law of Al Schutt, of Clark avenue. Stevens' father was connected with Forest City park when it was call Beyerle's park. The balloonist has great confidence in his airship and says it is better than all others. He married Mary Schaffrauko, daughter of John Schaffrauko and Julia Shurka, on 18 December 1902 in Ohio. Alois L. Jud and Mary Schaffrauko appeared in the US federal census of 15 April 1910 in Cleveland, Cuyahoga County, Ohio, at 5201 Clark Avenue. Other members of the household included Elenora Schutt and Joseph Schutt. Alois L. Jud died on 5 November 1910 at age 64. The following appeared on 6 November 1910 in the Cleveland Plain Dealer: Alois Schutt, for twenty-five years a gun and locksmith of this city, died yesterday at his home, 5201 Clark-av S. W.
Mr. Schutt was 64 years old at the time of his death. He was born in 1846 in Alsace, then a part of France. In 1854 he came to this country and to Cleveland with his parents. At the age of 24 he opened a locksmith shop and worked steadily at his trade until fifteen years ago when he retired. He leaves a widow and seven children.